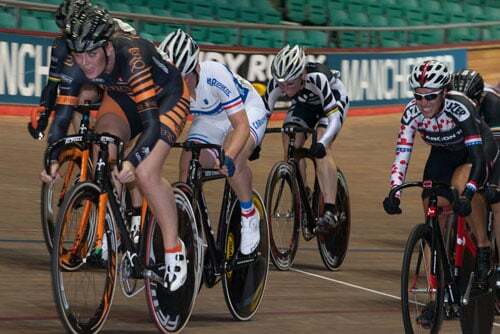 Getting up at the crack of dawn, Lou Haston travelled down to Manchester with her Scottish Cycling team mates to ride the ACT Easter Monday track meet. With racing starting at 11am Lou and co. left Glasgow at 6am, Dave Daniell driving and Emma Baird, Gemma Penman and Lou putting up their feet and having a wee sing song! Lou – The first race was a 12 lap Women’s Scratch race, where I got boxed in and finished in the bunch, taking 4th. It must have been a good warm up though, because I rode a PB in the Flying 200. Next up was a mixed Keirin where we were riding with the men and I was happy to finish upright and 2nd in a race with a big crash. Having seen the carnage in the mixed Keirin, I was a little cautious in the women only Keirin and again finished 2nd, but at least I had all my skin! And then it was time to pack up; it had been a long day, but good to get rid of the cobwebs.